Bob Pearce fought back tears and paused for a time to regain his composure when asked to recall when he realized that Hurricane Michael was going to be the big one. That emotional moment was a departure for Pearce. Unflappable, he stands 6-5, is hard to coax a laugh from and has seen an awful lot. For 17 years, he has worked for the American Red Cross, as a chapter executive in Panama City and in recent years as a regional disaster director whose theater of operations includes more than half of the counties in Florida. He has been deployed as a member of recovery teams to disasters in Florida and beyond. In so doing, he is called upon to maintain an appropriate measure of professional detachment. “I was born and raised in Panama City,” Pearce said during an interview conducted on Nov. 27, almost seven weeks after the third most powerful storm in modern history mauled much of Northwest Florida. “To have to do disaster work in my hometown, that has made it very personal. It’s one thing if you are away in South Florida after a storm or in California due to the wildfires or in the Northeast following Super Storm Sandy, but it’s entirely different when it’s your friends and neighbors and their homes. This is where I grew up. These are schools that I attended. Pearce was at an ad hoc regional disaster headquarters that had been established at Red Cross offices in Tallahassee when Hurricane Michael’s storm surge erased much of Mexico Beach and its winds reordered communities from Millville to Marianna. The Red Cross had been monitoring Michael for two weeks, ever since it appeared as a disturbance off the coast of Africa. Well after it entered the Gulf of Mexico, it was expected to make landfall as a tropical storm or a minor hurricane. Even so, 14 shelters were opened in 11 counties, three of them in Bay County at Northside Elementary School, the Deane Bozeman School and initially at Merritt Brown Middle School. As the stormcast worsened, county officials thought better of Merritt Brown — “something about the generator,” Pearce said — and moved evacuees already present there to Rutherford High School. “We had plans in place, and we had significant materials and resources moved into proximity to us at a staging area in Thomasville, Georgia,” Pearce recounted. Then, as the storm’s internal pressure kept dropping, a sense of alarm overtook the Tallahassee headquarters. “We now knew that something big was happening and we were scrambling to add more personnel, but in a matter of hours there was no way we could be ready for what was to come,” Pearce said. The storm roared ashore as a strong Cat 4, just a few miles per hour shy of a Cat 5. Red Cross personnel in the shelters stayed with their clients while trying to set aside fears about what was happening to their own homes. At Rutherford High School, a portion of the roof was compromised and evacuees had to be moved within the building to safer, drier locations. To Pearce, in Tallahassee, came the realization that he had a hard time talking about. A day after landfall, Pearce departed Tallahassee for Bay County in a Red Cross truck with Jeff Parker, a regional disaster officer from South Florida. Interstate 10 would prove “impenetrable.” Pearce dropped down to State 20 and conditions were little better. Twice, he was stopped by downed trees, but on both occasions men with chainsaws materialized to clear the road enough for Pearce and Parker to resume their progress. They made their way to the Bozeman School, located 12 miles north of Lynn Haven on State 77, checked in with Red Cross personnel there and found that the shelter was in good shape. Leaving the school, Pearce found that traffic headed into town was backed up for miles, but he caught a break. A National Guard major permitted Pearce to slip his truck into the middle of a southbound convoy and he made it to Panama City in 30 minutes. Pearce made the rounds and discovered that his home in Cedar Grove, while surrounded by homes either heavily damaged or destroyed, hadn’t lost a shingle — he has a three-year-old roof and a wind mitigation certificate. He found that all of his family members were fine except for his son, a firefighter/paramedic who injured his spine and spinal cord while working around his Forest Park house after the storm passed. Alex Pearce, paralyzed from the waist down, was flown by helicopter to Fort Walton Beach where emergency surgery was performed. At this writing, he is “relearning how to walk” at the Shepherd Center rehab hospital in Atlanta. These days, Pearce frequently uses the word, “stood.” Maybe that’s an understandable unconscious response to all that Michael toppled: cell towers, homes, schools, businesses, dreams. That sign, which Pearce termed “iconic,” has been a Panama City fixture for decades. Updated daily, it displays the number of days remaining in or until hurricane season. The sign was salvageable. The Red Cross building, which had been in service since the early 1950s, was not. For days after the storm departed Florida, Panama City and surrounding communities and the shelters, specifically, were without power and water. Conditions in the evacuation centers rapidly deteriorated. “When you have hundreds of people staying in a place and you can’t flush the toilet and you are struggling to get services and portable toilets in there — yes, we had issues,” Pearce said. At its peak, the shelter program housed about 1,300 people. A total of 2,500 Red Cross personnel were deployed to become part of DR 478-19, the disaster-response number assigned to Hurricane Michael. They came from throughout the United States and from Mexico, Canada and Europe. Ninety percent were volunteers. Some left soon after they arrived. For people who could not shower, watch TV or make a phone call and who didn’t know how their property had fared, something to drink and a hot meal came as the day’s only comfort. The Red Cross, working with Chartwells, the Bay County school district’s food service contractor, got its meals machine up and running within 48 hours. In four weeks after the storm, the Red Cross served 600,000 meals at the shelters and elsewhere. They distributed more than 800,000 snacks (bottles of water with chips or cookies). In addition, the Red Cross established a major warehouse operation in Marianna. Thirty-five box trucks delivered more than 100,000 disaster relief supply items to the devastation zone — clean-up kits, shovels, gloves and more. “Most of the clients we were dealing with had never experienced the aftermath of a major hurricane, and I hope they never have to deal with that again,” Pearce said. “There was a lot of frustration, but there is nothing magic in the world. We may have five shower trailers staged somewhere, but it takes a long time to drive them here, especially when road conditions are bad. On Nov. 27, the census at Arnold High School, the last Bay County shelter in operation in Bay County — at some point evacuees in Panama City were moved to schools in Panama City Beach where power and water were available — stood at 83. Most who remained had been homeless before the storm struck. In touring the devastation zone, Pearce experienced so many flats that his tires must have resembled a heroine addict’s arm, as many times as they had been punctured. In Calhoun County, a logging truck pulled Pearce out of a ditch at 1 a.m. It was raining and he rounded a curve on a slick dirt road, swerved to avoid a fallen tree and left the road. In his travels, he has been extended welcome kindnesses. A Parker family insisted that he stop and share in the food they were grilling outdoors. Rolling through a Lynn Haven neighborhood, people cheered his name. “You drive around and you pass businesses and you realize that all of them are either never going to reopen or they are trying to find a place where they can get up and running again,” Pearce said. But, said Pearce, “I didn’t find anyone who was arguing about politics or race or religion or any of the issues that supposedly divide us. Yes, there was some bad stuff going on, there was some looting — there’s always gonna be a few a-holes — but I learned that people in general are much stronger, more resilient, kinder, more compassionate and I’ll just use the word, better, than you might think if you are a heavy consumer of the 24-hour news networks. Pearce said he has long believed that adversity doesn’t build character; it reveals character. He recalled seeing three men in Parker moving about their neighborhood with chainsaws and looking to be helpful. “They didn’t have to do that,” Pearce said. “They didn’t know most of the people they were checking on. They were just seeing if everyone was OK. Everywhere I went, I saw neighbors helping neighbors. And maybe that is the big takeaway for me from this storm. Generally, Pearce said, the people who fared the worst had done the least to prepare for the storm. “You cannot preach enough about being prepared, having a plan,” Pearce stressed. “People get tired of hearing that and they’re busy and they don’t have time to worry about whether they have three or four days’ worth of water and food and medicine. They don’t have 20 extra bucks to stock up. According to county officials, only an estimated 20 percent of the more than 100,000 people affected by a mandatory evacuation order, issued in Bay County days before Michael made landfall, actually left. 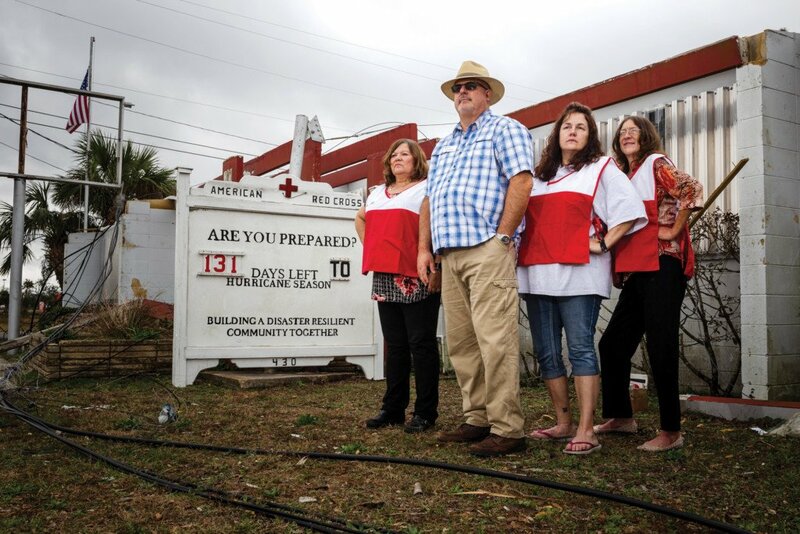 As a Red Cross chapter leader in Panama City, Pearce once recorded public service announcements during a long-running lull in storm activity that sought donations by reminding people that the agency responds not just to large-scale events, but even to house fires. For 10 years after Hurricane Wilma stuck the state in 2005, no hurricane made landfall in Florida. “Around here,” Pearce noted, “we kept saying, ‘We’re due for a big one.’ Well, we’re not due anymore.